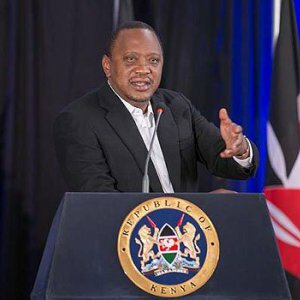 Uhuru Congratulates Donald Trump For His Win, Does He Even Care? President Uhuru Kenyatta and his Ugandan counterpart Yoweri Museveni were one of the first African presidents to congratulate America’s president – elect Donald John Trump. Mr Trump emerged on top of his opponent Hillary Clinton in a closely contested prsidential election to be become the 45th President of United States. Presidents Kenyatta and Museveni shared their congratulatory messages to their newly elected colleague on their social media pages. President Kenyatta wrote; “Kenya congratulates Mr Trump for his victorious campaign, and his main opponent, Mrs Hillary Clinton, for her valiant effort. Trump has been quoted a few times calling african leaders greedy and saying that Africa should be colonized again to help put it in order. The 70 year old American businessman is scheduled to officially take office on January 20, 2017.